What makes this book stimulating is the fact that you can open it at any page and find something to eat, something to read, something to cook and something that you were not looking for. It's a kind of, you know,. This week we’re excited to welcome François-Régis Gaudry to SALT + SPINE, the podcast on stories behind cookbooks. François-Régis is a food critic, radio host and author of Let’s Eat France! 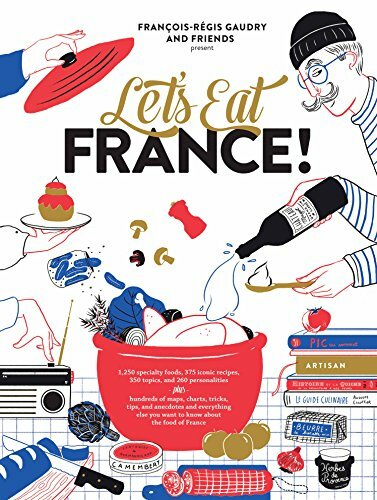 Is Let’s Eat France a cookbook? Well yes, but with 1,250 specialty foods, 375 iconic recipes, 350 topics, and 260 personalities packed within its 432 pages…it’s not your standard collection of recipes. Plus, it weighs six pounds (2.7 kilos). Creating Let’s Eat France! was no small feat. François-Régis had the help of a small army of friends, experts, food artisans, academics, cooks, confectioners, sommeliers to write what is a fun, informative and appetizing read. We sat down with François-Régis at San Francisco's The Civic Kitchen cooking school to talk about whether french fries are French (maybe), the thousands of cookbooks in his personal collection and how French culture is synonymous with its food.